Indulge in Healthier Baked Oatmeal for breakfast! Comfort food that’s low carb and protein-packed. Baked oatmeal reminds me of college. Those mornings when I had a few minutes to hit up the hippie dippy vegan-friendly eatery on campus for their beloved brunch, I would make beeline for one of their giant portions of aromatic cinnamon-sprinkled carby goodness. Being home in Florida I no longer have access to those bowls of manna, so I recreated their baked oatmeal with a protein-packed twist. It’s lower in carbs with a creamier, richer mouth feel and an added touch of vanilla to kick up the flavor and make you feel like you’re eating dessert for breakfast. Isn’t that why people eat breakfast in the first place?! With eggs, sliced almonds, and blended up cottage cheese (shh! you’ll never know it’s in there) this meal will stick with you longer than the couple of hours that oats and sugar would take to digest and leave you ravenous before noon. My favorite way to eat this oatmeal is cold, in bar form, driving to class or munching the first few minutes of lecture. Add 1/3 cup slivered almonds to a food processor. Pulse 10 times, or until the flakes are chopped up into oat-sized pieces. Add mixing bowl. Put the rest of the almonds into the food processor and grind them up until they have the consistency of a coarse meal. Add the remaining dry ingredients to the mixing bowl except the erythritol. To your food processor bowl (no need to clean it!) add the wet ingredients and erythritol. Process for 1-2 minutes until smooth. Stir wet ingredients into dry ingredients and let sit for 1 hour, or overnight. Butter an 8 by 8″ glass dish and line the bottom with a cut square of parchment paper. Bake 45-55 minutes at 350 degrees Fahrenheit. Let cool for 1 hour and serve. Once cooled, wrap uneaten servings in plastic wrap and store in fridge. Reheat individual servings if you like, or enjoy them cold as a breakfast bars! For this recipe you need to measure out your stevia into tiny portions. The reason for the funky small measurements is that I try to use just the right amount of stevia in each recipe to get the finished treat as sweet as possible without any aftertaste. It’s all for you guys! These mini measuring spoons from ebay are my current secret weapon in my baking arsenal. You can label the bottom of each spoon with a sharpie to keep track of which spoon goes with which fractional measurement. Keepin’ this post short and sweet since my life has currently been overtaken by organic chemistry! In an effort to post more, I’m ditching my perfectionistic tendencies and going to be throwing up more condensed posts. Comments are open and unmoderated again so you guys can share your knowledge freely here. I appreciate your continued support! « My recipe for a Sugar-free, Healthy “Coffee-cino” frozen coffee drink. Move over, Starbucks! 24 Comments on Indulge in Healthier Baked Oatmeal for breakfast! Comfort food that’s low carb and protein-packed. I think you're a genius 🙂 Can't wait to try this (just need to get some cottage cheese). My working daughter is always looking for something to grab for breakfast. She's lost 71 lbs LC'ing and I love to help. What size glass pan? 8×8? 9×9? Slbbw = Thank you for the nice comment. 🙂 Congrats to your daughter re: her success with low-carbing, wow! Let me know how she likes the oatmeal, please. Once again Lauren you have outdone yourself! Looks yummy, I like the cottage cheese addition. We'll have to try it out this week, need to get more cottage cheese anyway! And I totally understand about o-chem. I personally detested it. But of course I had a lousy prof the first time and a fabulous one the second. Ended up with a B+. Good luck to you! Thanks for the healthier baked oatmeal recipe. If you don't mind, can you submit your healthier baked oatmeal photo in http://www.foodporn.net ? Thanks for a great recipe, i really need to try that one out! (: I have just started up my own heathy food blog, maybe you would take a look? Thanks a lot! Thanks for the recipe! One question, I see in the recipe where you say don't add erythritol yet, but I don't see when you are suppose to add it? After it sits for the recommended hours? Wow! This baked oatmeal looks delicious! The only time I've ever had baked oatmeal was when I was at a friend's house, and it was so delicious, but very carby/sugary. I can't wait to try one that I don't have to feel guilty about eating:). Thank you so much for providing such wonderful recipes and helpful health tips on your blog. It makes a world of difference for those who are trying to live a heather lifestyle. i am following your blog, i like your post and recipe also. Was just about to make this and realized I only have regular oatmeal.. total bummer 🙁 Considering making it anyway and just letting it soak a long time. Whatcha think? I made this as a single serving (divided everything by 8) and microwaved it in a mug for 3 minutes. Worked great!! This is really interesting stuff you shared here. Hi Lauren, I think I will try this with quinoa flakes. I have that tiny spoon set also, it was a gift from a friend. Alas, I only have 3 of the five left: dash, smidgen, and pinch. Don't know what happened to the rest. 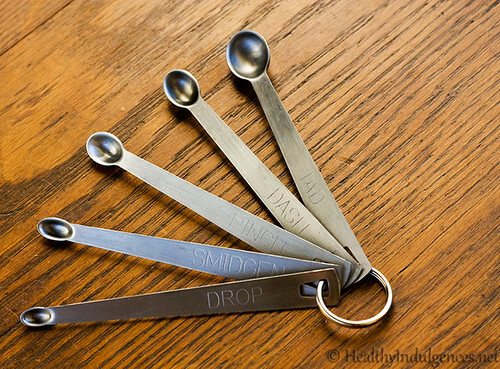 Based on your 1/8 and 1/16 measure of the stevia, do you recall which one of the mini spoons you used? Actually, now that I have a recipe book on my kindle I find that I don't like it very much at all. When I made anything at all, I always write notes on the recipes with changes or adjustments. Recipes on kindle do not allow this. Hey Lauren, I finally decided to make this as I had cottage cheese to use up! I determined that the “smidgen,” mini measurer was closest to 1/32 and so just used 2 of these to equal the additional 1/16 measure of stevia extract. I did not use the raspberries and they did come out on the sweet size for me, but oh so hard to stop eating. Even my DH like them, and that is saying alot! Also, did not have quick oats in the house, but had quinoa flakes and when I did the numbers at MyFitnessPal.com, came up with 10g net carbs and 11g protein. Since I am a protein hog, this should cover me nicely for breakfast. They were very moist, I did not soak overnight, more like a few hours in the fridge and baked for just 45 minutes and they were firm, and brown on top. Rica – Great to “hear” from you! I am in the process of putting together an e-book. Thanks for sharing your re: the formatting of e-cookbooks. My e-cookbook will also be available as a pdf so you can print out a hard copy. Smidgen – 1/32 tsp (< -- looks like you got that one!) ;) So happy that the oatmeal turned out well for you. Works with quinoa flakes too, huh? I'll have to pick some up at the healthfood store and play around with 'em. I've been getting really bored with breakfast lately and this had made eating way more worth it. These are amazing. They keep me absolutely full until lunch. I really like your blog. Thanks, Lauren! 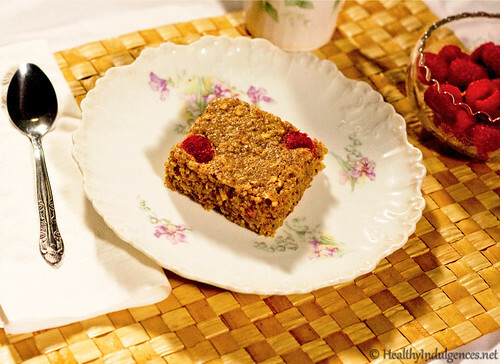 1Pingbacks & Trackbacks on Indulge in Healthier Baked Oatmeal for breakfast! Comfort food that’s low carb and protein-packed.